IT cannot be said with certainty as yet who were the persons behind Friday’s bomb blast in a Hyderabad mosque, which claimed at least nine lives, but what is absolutely beyond doubt is their motive. The inhuman act was committed to unleash communal violence in the city, which is making its mark in the IT world. HERE is one that is definitely not for the aam aadmi. Even as the tax-paying middle class, the salaried in particular, coughs up huge chunks of its meagre incomes as income tax, the government has the gall to grant exemptions to cricket stars like Sachin Tendulkar and Sunil Gavaskar, on money earned from endorsements and other media-related activities abroad. MR Paul Wolfowitz finally made the exit from the World Bank presidentship, and the consensus clearly is that he should never have been there in the first place. Tales of ineffective leadership, arrogance, and a disregard for the nitty-gritty have come tumbling out from those who knew him during his days as ambassador, and in the service of the US Defence Department. Ms Mayawati merits all the praise that has been showered upon her for her victory in the UP elections. During all those months before polling day when all her opponents were busy crisscrossing UP to wake up — their real or potential voters, or sat on one political stage after another to show how wide was their political reach, Ms Mayawati was quietly marshalling the ranks of her silently obedient party. WHAT’S one to do when not just the brat pack, but most of the parent fraternity known to you goes gaga about the latest antics of an arachnid who’s given to romping all over the skyline? WHEN I first met Gohar Ayub, former foreign minister of Pakistan, in 1984 at his residence in Abbottabad, Pakistan, he said that his father General Mohammad Ayub, still in power, told him that he (Ayub) would get a copy of secret defence papers before they reached the table of Jawaharlal Nehru, the then Prime Minister. Subsequently, Gohar changed the version slightly and said that a senior Indian army officer used to pass them defence secrets. THE optimists have it that India’s economy could grow nine per cent this year. Poverty could be reduced by 1 per cent every year and become a thing of the past within the next 30 years. What’s more, India could soon replace Germany as the world’s fifth largest market. A larger economic cake will mean that there is more to go around; development will mean plentiful progress. EVER heard of politicians going to LKG and UKG? Well, these are the categories into which members of Parliament have been divided on the basis of their proficiency in Hindi. And behind this is noted linguist and founder of Bhasha Bharti, professor Vishwanath Mishra. IT cannot be said with certainty as yet who were the persons behind Friday’s bomb blast in a Hyderabad mosque, which claimed at least nine lives, but what is absolutely beyond doubt is their motive. The inhuman act was committed to unleash communal violence in the city, which is making its mark in the IT world. The perpetrators succeeded too, considering that an agitated mob went on the rampage later, forcing the police to open fire, resulting in three deaths. Such incidents unfortunately gather momentum of their own and that fits in very well with the designs of those hell-bent on widening the rift between communities in the communally sensitive city. Sensible persons on both sides have to be on their guard against blame-game based on rumours. One saving grace is that the common citizen by now knows what dirty tricks are employed. In the violence that followed the mosque blast, many people suffered irrespective of their denomination. The use of sophisticated cell-phone timers shows that it was not a local conspiracy. Such mechanisms are favourites of Kashmiri militants. The similarities with the recent blast in Malegaon (Maharashtra) also point the accusing finger at such organisations as Lashkar-e-Toiba and SIMI. It is another proof that terrorists are no respecters of any religion. When it comes to spreading terror, they can kill their own kinsmen without any pangs of regret. Most victims happened to be from the lower middle class. Their being innocent did not save their lives. The incident, perhaps, could have been averted if the police had been more vigilant. Hyderabad happens to be a sensitive area. There was need to be extra cautious on a Friday prayer day. The Rapid Action Force used to be deployed in the vicinity of the 400-year-old mosque till March, but was later withdrawn. The RAF is not meant for routine watch and ward responsibility but the police setup was certainly expected to be more alert. Needless to say, the police need to pull up their socks, even if it is after the damage has been done. Had the two other bombs which were detected and defused exploded, the toll could have been far higher. HERE is one that is definitely not for the aam aadmi. Even as the tax-paying middle class, the salaried in particular, coughs up huge chunks of its meagre incomes as income tax, the government has the gall to grant exemptions to cricket stars like Sachin Tendulkar and Sunil Gavaskar, on money earned from endorsements and other media-related activities abroad. While even the existence of sports on this particular exemptions list is questionable, there is clearly nothing sporting about posing with products in front of cameras and then claiming income tax exemption to the tune of lakhs and crores of rupees. The Income Tax Department’s initial defence that this was income from “artistic” work abroad, which is exempted, would be downright laughable if it weren’t such an affront to honest tax payers. The Controller and Auditor-General’s report placed in Parliament has indicted the department on this count, and I-T Department officials have now said that the cases would be reassessed. These verbal assurances must be followed through with decisive action, and the money due to the government exchequer must be recovered speedily. The CAG report makes it clear that Tendulkar benefited by Rs 3.62 crore while Gavaskar benefited by Rs 80.34 lakh, with the department agreeing to place chunks of their income under Section 80RR. The report has also criticised the under assessment of several big companies. When the government is struggling to find funds for development and welfare programmes, and is constrained by a recalcitrant fiscal deficit, such laxity is unpardonable. Meaningless exemptions of various kinds, including those on the agricultural income of rich farmers, are serious distortions and must be done away with. The tally of arrears alone that the department has failed to recover amounts to tens of thousands of crores. There is no sign of any serious intention in attempting to recover these amounts, and this is inexcusable. The government should push the department to make amends. MR Paul Wolfowitz finally made the exit from the World Bank presidentship, and the consensus clearly is that he should never have been there in the first place. Tales of ineffective leadership, arrogance, and a disregard for the nitty-gritty have come tumbling out from those who knew him during his days as ambassador, and in the service of the US Defence Department. Of course, it is always easy to hit out at a man who is down. But the intense opposition he created within the bank, and the testimonials of those who have criticised him both with Washington DC and outside speak of problems deeper than giving hefty raises to girlfriends. While the $133,000 to $194,000 raise that Shaha Riza got stole the limelight, Mr Wolfowitz had, in fact, brought in several of his own men with him who got salaries in the $ 250,000 range of World Bank vice-presidents with PhDs and decades of service. Accusations of creating a small coterie that appropriated a lot of power, being arbitrary about lending decisions, or worse, allowing those decisions to be influenced by US foreign policy considerations made matters worse. And all this while Mr Wolfowitz’s public focus was avowedly on ending corruption in recipient nations. The spotlight now is on the next President of the World Bank, and the convention of letting America nominate the bank is being hotly debated. Most of Europe definitely wants a change, and so should most of Asia. America is still expected to assert its “right” however, and development experts, both within and outside the bank, will be keeping their fingers crossed. The institution still has a relevant role to play in a world where private capital is not forthcoming for crucial development projects, and in bailing out nations from financial and economic crises of various kinds. And its high visibility and international profile puts it on a unique platform in the fight against poverty. It requires, and deserves, a leader with vision, intelligence and ability — not someone just looking for a plush reward posting. If it can get such a leader — American or otherwise — it can quickly put this turbulent phase behind. MS Mayawati merits all the praise that has been showered upon her for her victory in the UP elections. During all those months before polling day when all her opponents were busy crisscrossing UP to wake up — their real or potential voters, or sat on one political stage after another to show how wide was their political reach, Ms Mayawati was quietly marshalling the ranks of her silently obedient party. So subdued was her presence in public that for a time she made one wonder whether she was taking the approaching elections too lightly or had been intimidated by them because this was the biggest electoral challenge for her since the fall of her government in Lucknow and the death of her guru and long-time political companion, Kanshi Ram. But it turned out soon that she appeared to be so inactive only because, apart from mobilising her traditional supporters, she was also busy luring over junior but useful workers from other parties, particularly from parties that are known for their prominent following among Brahmins on one side and Muslims on the other. A few of both on her platform, whether themselves important or not, would have an important effect on a sufficient number of voters of both communities. At the same time, being less than important leaders in their own right, they would not draw any limelight away from herself as the sole leader of her party and its Dalit persona. Thus, she was able to burst upon the scene just when the time was ripe, and not only with her faithful Dalits behind her but also a surprising array of showpieces ranging from Brahmins to Muslims. Her support base was, therefore, rightly described as a rainbow. Only the Congress, and that too only in its better days, could have outshone the effect of this varied display on the electorate. But it would be good for her to remember that a rainbow is a very transitory phenomenon and even while it lasts it can be slippery. It is easy to conjure but difficult to consolidate, as the Congress discovered in the 1960s and 70s. So long as the following of the Congress consisted mostly of a politically undifferentiated and unaware mass of the rural poor it was happy to be led by the glow of distant leaders like Nehru. But it remained a reliably united electoral force only so long as certain conditions were met. First, different strata among them could not distinguish between their differing goals, such as of caste. Second, when they could do that they still could not define them as competing parties. Third, when their parties came most of them were too small to become substantial platforms. Fourth, when a few did manage to acquire some size they could not acquire a proportionate place in legislatures because of India’s first-past-the-post electoral system. Fifth, when a few of them did, among them the parties of the Left and Ms Mayawati’s Bahujan Samaj Party, they remained so allergic to each other that they could not combine into a politically effective electoral alliance in the field. Sixth, the more they remained pungently exclusive the more they alienated potential allies even within legislatures and could not combine to form effective coalition governments. Seventh, the more each built walls around itself the more it became territorially isolated and numerically vulnerable to the divide-and-rule electoral strategies of the Congress and its clever manipulation of the President’s role in the formation and survival of non-Congress governments. This last point is worth considering further. A BSP sympathiser or leader may think that this party, commensurate with its presently impressive presence in the UP legislature, will have such an important part to play in the election of the President that no incumbent in Rashrapati Bhavan would dare to trifle with its government in UP, and it would also keep the state’s Governor in check. This confidence is justified, but only up to a point. First, removing a President is such a complicated task that once elected, the President is pretty much his own master in the exercise of his discretionary powers. So is a state’s Governor in deciding who he should invite to form the government, and this invitation is sometimes half the battle, considering the circumstances in some legislatures at many a time. Second, a “rainbow” coalition can be one of those circumstances, because a rainbow fades if the wind turns adverse to its survival. The winds can turn in any of the following and several other circumstances: any constituent of the coalition is unhappy with its share in the coalition government, and thinks it can get a better deal from an alternative coalition; or a clash of colours develops between the constituents of the rainbow; or the same poaching and defection games by which it brought itself into being in the first place are started against it by a rival who is close to it in numbers and is at least as experienced and bold; or the coalition is not sure it has a sufficient majority to face a “request “ by the Governor, may be at the behest of New Delhi, to prove that it still has the confidence of house; or, what is very relevant in the present circumstances, by its own high-handed actions it loses the cushion of public esteem which can help it tide over many an adversity. Unfortunately for it, the Mayawati government is vulnerable to all these circumstances, and she herself has had close personal experience of many of them in her previous regimes, all of which were relatively short-lived. On top of all that she has, in her very first hours in office, impetuously made some blunders which can cost her a lot if and when — other adversities accumulate as well. She has used a battle axe instead of a surgeon’s scalpel by taking wholesale action against a couple of hundred officials, not just a few, whom she suspects of acting against her. A proper investigation and suitable action against them would have been quite in order instead of this hurricane let loose in a blind rage, which is not the best way of keeping and retaining friends. That should worry her even more when her majority in the House is far from safe or stable, and the second biggest party in the House is close enough to engineer a strike with the formidable experience of Mr Mulayam Singh Yadav in playing these games. Ms Mayawati has crossed swords with him, and with the next biggest party, the BJP, to her disadvantage. For her own part she badly needs to enlarge and consolidate her presently slim and friable overall majority, of a dozen or so in a House of over 400, before she sets out to make enemies. If she plays her hand with patience she can bring about as far reaching a change in the polity on behalf of the Dalits as Ram Manohar Lohia inaugurated on behalf of the OBCs. The rainbow she has hoisted on their behalf is not the first, but it is the first which has been set up by a Dalit leader and mostly with the forceful support of a newly awakened Dalit community. Well, you go prancing too. To arrange for an immediate audience with him, that is. Now, it was hardly flattering for one’s TRPs (Trendy Resourceful Parenting score) that our wallets hadn’t contributed to the whopping $ 382 million that Spiderman 3 grossed in its opening weekend. The peer pressure had me springing into the act of enterprising parent. Without further ado, tickets for the flick were managed. Ah! It was more like a ticket to the select With-IT Parents Club, whose latest eligibility was an ability to drop names from the movie as if they were celebrities who’d just moved into your neighbourhood. This wisp of paper was also my son’s passport to the Junior Spidey Chat Circuit that had already cast its web from classrooms to locker rooms to cyber chatrooms. So, some manic post-office hour driving and screeching of brakes later, we finally landed at the multiplex for our date with Spidey. Soon enough, the action got going. So did the hurrahs from the audience. Toddlers to teeny boppers to trendy parents, all erupted into a collective rejoicing each time the iconic action hero played the saviour. Yours truly too was among the cheerleaders, though for reasons that didn’t have to do entirely with cinematic appreciation. Swish. Swoosh. Spidey was in his element, diving to rescue a stratospherically inverted citizen with characteristic agility. That set my mind brimming with possibilities. How I wished I could hire Spidey for a day! Not because my home turf is inhabited by the likes of Sandman. But because I was keen on utilising his gravity-defying, skyscraper-scaling powers in the upper reaches of my relatively dwarf of a premises. To go squish and squash at all those black-scaled monsters who’ve made a habit of crawling up my four walls with the panache of upwardly mobile reptiles. All this imaginary adventurism about domesticating Spidey and letting him loose on the lizard population was, however, interrupted by a crescendo of cheers. Onscreen as well as off-screen. Spidey was at his special-effects best. He was homing in on the black goo monster Venom. Heads turned. Mine too. For it struck me that this petulant sound had emanated from my immediate neighbourhood. From my little boy, to be precise. Since I didn’t know where to look, my cranial muscles thought it best to redirect my head towards the silver screen, for the moment. Don’t know if Spidey would’ve been amused. The parent in me certainly wasn’t. In the latest interview to Karan Thapar, a distinguished anchor, Gohar has said that a brigadier in the Directorate of Military Operations sold to Pakistan Indian’s 1965 war plan for a paltry sum of Rs 20,000. Gohar is publishing his book in India. He is feverishly looking for avenues to get publicity. His interview with Karan is part of the same exercise. I would have put aside the allegation by Gohar but for the slanted and subjective questions by Karan, relating to Field Marshal SHFJ Manekshaw. That Karan was “Devil’s Advocate” was understandable. Some heat and rhetoric was in order. So was the badgering of Gohar. But what I object to is the manner in which Karan conducted the programme, almost suggesting that Manekshaw was the guilty officer. Even a thought on those lines is preposterous. Karan is aggressive but largely fair. I could not understand how he could even mention Manekshaw’s name in the context of someone passing on defence secrets to Pakistan. He is one of the most loved and revered military figures of India and his record of service is a testimony to his outstanding contribution to the nation. What shocked me was the way in which Karan would come at Gohar again and again, charging like a wounded animal, to almost force Gohar to say that Manekshaw was the officer concerned. Gohar said repeatedly that he was not naming Manekshaw and that it was he (Karan) doing so. Still Karan went on and on. I can imagine the reason for Karan’s hurt. As a child, he must have seen his father, General P.N. Thapar, chief of army staff, suffering from the ignominy of having lost the war against China in 1962 when he was not to blame. But I can assure Karan that Manekshaw had no share in the campaign of vilification built against General Thapar. In fact, Manekshaw was himself at that time facing an inquiry on the framed-up charges. He was subsequently exonerated. The person responsible for heaping all the blame on General Thapar was Nehru. In fact, it was Krishna Menon, the then defence minister, who had a knife against the general and wanted to see his back. Menon would call him a toothless old man. The general had vainly argued that the Indian army did not have the strength needed: the ratio was six Chinese to one Indian. Still, as an honourable and duty-bound General, he offered to resign after the debacle in 1962. When he met Nehru, who declined to accept the resignation, he assured him that he was not to blame and that the responsibility lay somewhere else. However, when Parliament wanted Krishna Menon’s head and when even Nehru was not spared for “protecting” the defence minister, the anger boiled over. A few Congress stalwarts felt so let down that they even held Nehru responsible and wanted him to go. Nehru was so worried and upset over Parliament’s angry mood that he sent his cabinet secretary Khera to General Thapar’s house to request him to give his resignation in writing to make his verbal request good. Khera assured the general that the PM had promised not to use the latter. Yet, the general’s resignation was the first thing which Nehru announced in Parliament to mollify the members. It is another matter that Menon too had to go. General Thapar felt upset and met Nehru to protest against the announcement of his resignation without telling Parliament that Thapar had warned the government against going to war against China at that time. The general said “a great wrong” had been done to him in the manner in which his letter of resignation had been released without giving the background of circumstances obtaining at that time, particularly when nothing was said in his defence. Nehru promised him that one day Nehru would undo the wrong done to him. That day never came and the general continued to suffer from the humiliation without having been allowed to tell his side of the story. Karan should know that after the debacle, when Lt Gen Balmukund Kaul was removed from the Eastern Command, Manekshaw was the only officer who could retrieve the situation to the extent possible. Menon, still the defence minister, opposed the proposal tooth and nail. But Nehru rejected Menon’s objection. Reverting to Gohar’s allegation, I doubt if there was any top Indian army officer selling secrets to Pakistan. Gohar should produce some concrete evidence other than his own statement if he wants India to take his allegation seriously. I recall that at Abbottabad, where Gohar told me about the leakage of defence secrets, he also said that Pakistan would have meaningful talks with India only when the latter would disintegrate into six parts. Twenty-three years have gone by but India, however chaotic, is more united than ever before. And, willy-nilly, Pakistan is conducting meaningful talks to normalise relations with India. My advice to Karan would be that he write a personal letter to Sam Manekshaw regretting the impression created by the interview. Paradoxically these optimistic predictions run parallel to popular scepticism about the ability of the state to deliver even essential services such as water, power, education and health. Ninety-three per cent of children aged between 6-14 years have access to a school; many of them are deprived of a decent education because of incompetent and absentee staff. Poor governance, including mismanagement, inadequate revenues and waste of resources is common. Man-made water shortages in most Indian cities show up the inefficiency of the public sector. And the frequent power cuts problems in Delhi itself shows that the private sector may be as prone as the public sector to unaccountability, inefficiency and lack of responsiveness to the needs of citizens. In both cases, delivery is not the norm. The imperative is not necessarily to craft new policies and plans but to implement existing ones. This will be possible only if the quality of governance improves, which may be easier said than done. Any administrative reform has political implications, not least because the Indian brand of democracy has resulted in red tape, corruption and sheer disinclination to deliver to citizens. Democracy has empowered Indians of all classes and communities and frequent electoral swings have made elections the main instrument of accountability in India. But inadequate life chances mean that individuals belonging to certain groups seek patronage to get jobs, the political controversy over reservations for backward castes is merely the latest reflection of this unfortunate trend. This political ethos is not synonymous with accountable governance and service delivery. India is not the only country to witness links between politicians and the inauguration, success or failure of reform and of projects aimed at improving its outdated infrastructure. But projects are often a way for political parties to raise money; few penalties are imposed on companies who fail to complete projects; public suspicion about hush political money is widespread and foments distrust in the state and its intention and ability to deliver. Decentralisation is expected to bring government closer to the people at the local level and to increase popular participation in decision-making and in assessing delivery. But the success of decentralisation hinges upon the readiness of the centre and state governments to devolve real fiscal and administrative powers to panchayats; the former remain the major revenue-raisers. In Kerala and Karnataka panchayats raise a mere 1 per cent through taxes and user fees. So governments remain distant from citizens. Confronted with poor delivery and unresponsive government citizens everywhere often resort to their own arrangements - a kind of de facto privatisation. More information about, and sensitivity to citizens’ opinions, can help improve service delivery. In Bangalore, Citizens Report Cards have informed authorities about what works and what doesn’t, and this information has helped the authorities to improve some essential services. While every adult Indian has the right to vote, control over decision-making is largely confined to elections. Administration remains highly centralised, and local citizens’ committees have no legal or constitutional powers, no mechanisms through which delivery can be ensured. A culture of delivery must replace the culture of political clientelism which hampers improved governance and service delivery. Political clientelism perpetuates poverty. Governments are elected to carry out measures to improve living standards of people. For this to be achieved, the politics of gain must be replaced by the politics of good service. His son, linguist Sanyam, assists him in this political pathshala. The classes are divided on the basis of one’s proficiency in the language. So while UKG comprises politicians who know a smattering of Hindi, LKG has politicians who cannot speak the language at all. They are given training on speaking in Parliament and also tell to deal with media queries. The UP election results have left the main political parties in a state of shock. The Congress played its trump card but the charisma of the Gandhis and overflowing moneybags got no victory. Everyone one knows that the Congress has no cadre base or grassroots workers. Poster boys sitting in Delhi and passing clever remarks on TV don’t win you an election. Exit polls and opinion polls proved to be completely wrong. Mayawati Behanji does not care two hoots for the media. It is an alarming fact for the Congress that it is being wiped out of the states. one by one. Congressmen’s capabilities at the moment lie only in pulling each other down, paying tributes to the hierarchy and, of course, in giving tickets to relatives who have no qualifications to fight an election. They do not realise that the hardworking grassroots worker has lost interest in the party, which only rewards the corrupt, the inaccessible and the non-performers. The iron lady in pink with her gold necklace and diamond earrings in place. Do we not remember her birthday celebrations? Well, her house in Delhi is lit up, gates have come up and the elephant symbol is prominent. Forget her say in the Presidential elections. Political pundits are now talking about her eyeing the Prime Minister’s chair seriously. Behanji Mayawati announces her candidates two years in advance and works with them day and night, drawing up strategies. This lady got the Brahmins to come with her and proved her mettle by ignoring her competitors. She has vowed to throw the nautankiwalas – the film stars – out of UP. 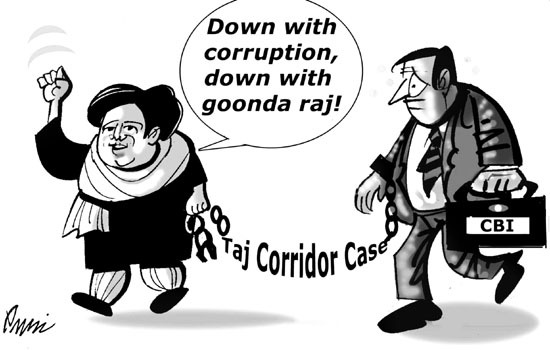 Amar Singh may say that jail is a nice place and is ready to go there but Mayawati says “Mare huye ko kaise marun?” The lady moves fast and has got her people in place. She is ready to roll. Well, she has more charisma and power than anyone else in the country today. An amazing lady, with a mantra that works and grassroots supporters who vote for her cutting across caste barriers.